Jontay carries single-adjusting side-release buckles in sizes ranging from 5/8" to 2" (in the color Black). 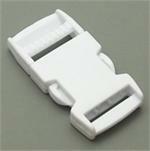 Single-adjusting side-release buckles are a light-duty, high-quality, polyacetal clips. 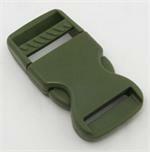 They are generally useful for applications where one end of the webbing is sewn or locked down in a fixed position and the other end is adjustable, and sometimes requiring a quick release.